Automotive Industry is definitely one of the biggest ones. 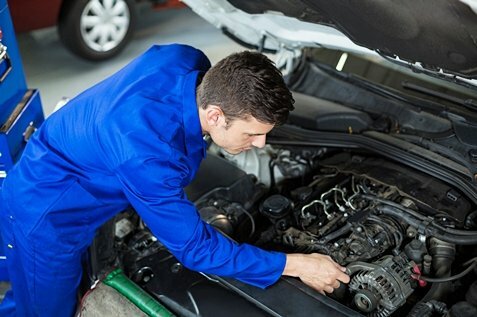 It is very complex and consists of numerous procedures before actual vehicle making, such as finding the appropriate material for each part, producing vehicle parts, designing, maintaining both the parts and working areas, etc. Although people nowadays cannot imagine living without vehicles, this industry does not have a positive impact on the environment and our planet. Air pollution is one of the worst consequences. Also, hazardous waste reduction, oil disposal and other production and recycling costs to the environment are impossible to measure. Considering the fact that we have only one planet to live on whereas, on the other hand, living without vehicles nowadays would be science fiction, some action has to be done! Many vehicle manufacturers have been working on a more environment-friendly approach to production in the last years. However, like every other change, it requires time. And when talking about the environment and our planet, time is priceless. So, it would be the best to start at least with smaller actions, which would definitely be of great help! Here are four simple steps you can implement right away into your workshop and help our planet instantly! Firstly, when it comes to purchasing all the chemicals and materials you need, try to make a list and then read it thoroughly. Find the most hazardous chemicals and materials and try to find a less hazardous replacement for them. Maybe you even realise that you can stop using some of them! When it comes to less hazardous chemicals, focus on those which are water-based or biodegradable. The next thing that would be smart to do is storing all the toxic chemicals in the appropriate way! Pay attention to the expiry date and put them in the order you purchase them. In this way, there would be far less waste which is always beneficial for the environment. Also, it would be great if you separated all the flammable chemicals in a separate area. 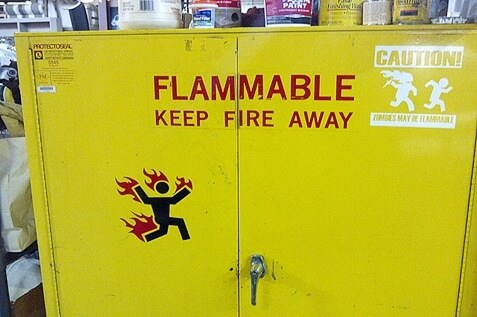 Nobody wants an extra fire-danger in the workshop, right? Whenever there is some info about taking care of the environment, water saving is always number one priority! And with a good reason, since the only thing we really cannot live without for a very long time is water! Now, what you can always make sure you do before you close your workshop for the day is to check the taps, showers and toilets for leaks. Furthermore, consider installing rainwater tanks for car washing and toilet flushing. Also, take care of evaporative cooling towers and get them serviced on a regular basis. This will prevent leakage and enormous water losses. In addition, while washing hands, do not let the water running from the tap all the time – stop the water flow while you are soaping your hands! This may sound a bit too simple. However, this simple act will save huge amounts of water. Metal waste is gathered in one place and sent to a local metal recycling facility. In this way, you are reducing the carbon emissions involved in transporting metal. Cardboard is segregated, saved and sent to a paper recycling facility. Oil filters are no exception to recycling. The only thing you have to do before sending them to the appropriate recycling facility is to drain them and store them safely. Make sure none of the employees and workers ever forget to recycle! You can create a recycling schedule or hang recycling posters all over the workshop. It will serve them as a great reminder! When you think of how many areas, parts and tools you have to clean in just one workshop, you cannot but think about wasting water. So, in order to save water, washing vehicles, degreasing motors and cleaning areas should be done as practically as possible. In terms of chemicals used for cleaning, try not to use toxic and hazardous ones. There is a number of different detergents and sanitisers which are environment-friendly, so you have many options to choose from. If you already have to use toxic and hazardous chemicals during production and repairing, at least you can avoid those chemicals in the maintaining part of the job! Also, one of the best things you can do is consider hiring a professional service for washing parts. Ecosafe Washer is a great tool since it is easy and safe to use, cost-effective and powerful! What’s more, it is completely non-toxic and non-flammable which means it is safe both for you and your environment. 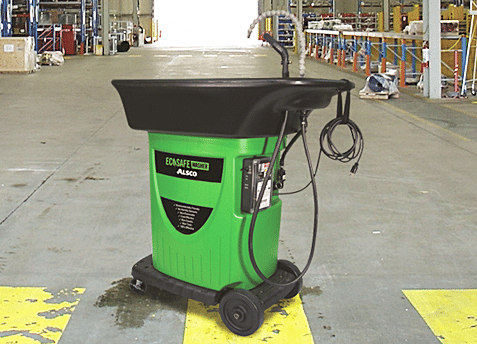 It cleans parts thoroughly without damaging them, and it is water-based and contains no chemicals at all! Call Alsco now, and our friendly representatives will happily answer all your questions and give you the best offer based on your needs!